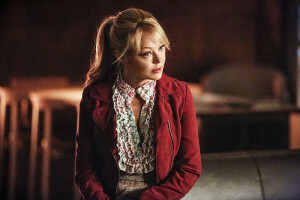 A new episode of Arrow titled “Code of Silence” airs this Wednesday, February 17 and it sounds like it might be a big one for Felicity’s mother Donna Smoak as played by Charlotte Ross. The actress – who was voted Best Guest Star of Season 3 by Arrow fans at GreenArrowTV – spoke with us this morning, and we talked about Donna’s future, her past, her love life, and her daughter’s [possible] wedding. You can read the interview below. 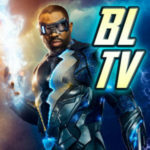 GREENARROWTV’s CRAIG BYRNE: To get started with a very loaded question: What kind of a “Mother of the Bride” is Donna? CHARLOTTE ROSS: What kind of “Mother of the Bride” would I envision Donna to be, because we haven’t shot any of that stuff yet… I think that Donna has been living and dreaming for that moment for most of her life. Even before she even had a daughter, she probably dreamt of the day her daughter would get married. I think you saw her reaction when she found out about the proposal which was not subtle. She loves her daughter so much and wants her happiness, almost more than her own. It’s a very excited, beautiful moment that she can’t wait for. How would she react if Oliver and Felicity just eloped or did something small? Oh! Gosh, you just shook me up on that one! Even the question made me feel slighted! I never thought of that. I think that ultimately, [Felicity’s] happiness is what’s most important, so I would like to think that she would try to think of the larger picture, but I think that she would inevitably be kind of hurt that she couldn’t be there, just to witness the beauty of them joining in marriage. How are things going with Quentin at this point? I think this episode is going to have a lot more going on with Paul and I. Donna has definitely had a long semi-painful if not very painful road in her love life experience, and what I love about her is I don’t think she’s become hard. I think that she’s just extraordinarily guarded, but she’s still really optimistic and hopeful, almost in a naive little girl sense that has gotten her into trouble in the first place, and I think one of the things she loves about Quentin so much is because he wears a badge and is an upstanding citizen, she thinks that his core values and him being trustworthy and honest is his number one goal, so she feels very safe that way. 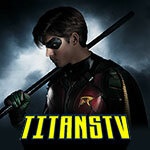 Of course, there are a lot of things that he has to deal with, in general, with Damien Darhk, so he is going to have lot of decisions to make, as are the rest of the cast on that show, in terms of how they handle Damien Darhk, in terms of everything else in their personal lives as well. It’s a hard juggle, you know? Were you surprised that the whole “SmoakNLance” thing growing like it did out of just that photo being Tweeted last year? Is that what you think, you think it was from that photo? You never really know where [it comes from], but we did a few table reads of the other episodes where we weren’t having any scenes together, and we both giggled about what it would be like to work together, because we loved, theoretically, the idea of how opposites attract sometimes. And, you know, he has his own guarded way of dealing with life, and Donna has a way sometimes of chipping at that, and breaking that down in people, and having them break out of their molds. So, we really liked the idea, and we were really shocked and really thankful and surprised at the traction, like you said, that selfie got. I don’t know for a fact that that put the seed in Marc and Wendy and Andrew’s brains, but I know they listen to the fans, and next thing we knew, we saw things escalating. For Paul and I, we really love it. We’re giggling half the time. There’s a natural uncomfortableness that translates into a natural chemistry that I think our characters have. I like the unexpected and the non-planned. That’s one of the funner things about TV. You can throw things in the mix and see what works and what doesn’t. I’m hoping people think it works! I know that we’re having a lot of fun. On the note of the fans, were you aware that the fans named you the Best Guest Star for Season 3? I did! I’m so grateful. That was so cool, and again, I am just so in awe, really, of the fan support that I’ve received. It’s really kind of shocking and humbling. I really owe it a lot to two things. One of which is the writing. They have written such a damaged yet lovable character who really wants to see the best in the world and is definitely very quirky, but they’ve given her a really good, grounded sense of when she has to get serious and deal with life in a real way. That balance has been so wonderful to play. And then of course, the second thing is Emily [Bett Rickards]. Emily is just such a beautiful angel and gift to work with, and we get in this rhythm and we have this chemistry. Some of the funnest acting scenes I’ve ever done in my career are with Emily. So, the combination is what I’m hoping, and think the fans are reacting to, but that being said, I’m still in awe and very grateful for their vocal support. I’ve never seen anything like it! You had mentioned that Donna wants Felicity to be happy, but does she think Oliver is good for Felicity? Does she notice the drama that surrounds Oliver’s life? That’s a really good point, because Donna has yet to have found out that he is the Green Arrow. So, when and if that day comes, I can’t imagine that’s not going to affect her opinion of maybe just the safety of her daughter. I don’t know; I’m just talking theoretically right now, but right now, I just know him as this very handsome millionaire who loves my daughter more than anything in the world, and she loves him so much, and he makes her so happy. So, I don’t know how much Donna is aware of that world that they have to fight through. I don’t think she has seen that much of it. Are you hoping we’ll get to see a reunion between Donna and her ex? I am hoping. As human beings, whenever we think of an ex that maybe has scorned us, it brings up these feelings in our stomach that make us feel tight, and aggressive, and protective… all of these different things that when that ex walks through the room, our whole demeanor changes. So, the idea of the history that I have with that character and the chances I had to make as a single mom working all these jobs and taking care of my daughter… there’s so much history there. I would relish having scenes with Tom [Amandes]. I think he’s a wonderful actor, and I think there’s just so much to draw from, to play in those scenes. Has Donna ever been scared of Felicity following in her father’s footsteps? We haven’t touched on that in the show, and we haven’t done any scenes about that, but I think that that’s a very, very good point. I don’t know to the extent of how much Donna knows that my ex was The Calculator, and that he became what he became. I don’t know the full history. For all I know, he became that after he left us. He might have been a simple mortal at that point. So, I actually can’t answer that question, because if I knew that now, I would assume that yes, but I have no idea. That’s why I want to play all that stuff. I’m dying to know what the history was! Are you at all worried that Donna is the person in the grave? We all are! I love it! I’ve seen so many cliffhangers of shows, and I have to say, this is the best I’ve ever seen! I’ve never been on a show where the cast is all looking at each other, going, “Do you know who’s dying? I don’t know! Do you know?” I’m talking to transportation guys that are driving us to the set, they’re saying “what do you know?” We’re all wondering just as much as the fans are. We have a lot of theories, but right when we think it could be somebody and it makes sense to be that person, we’re like “but it could be this–!” So I have no idea. It could be me. It could be. I know a lot of fans are worried that it might be. But I have no idea! 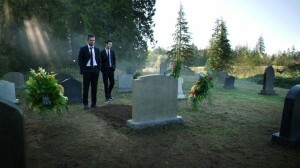 Arrow “Code of Silence” airs this Wednesday, February 17 on The CW! You can find some photos – including some shots featuring Charlotte Ross – here on the site! Our thanks to Charlotte Ross for taking the time to do this interview.